Distressed Homeowners: STILL Underwater But Staying Put! Loan Originators: DIG and Document! ATTOM Data Solutions/ RealtyTrac released their Midyear 2017 U.S. Foreclosure Market Report™ today and it continues to show that our foreclosure nightmare is slowly fading into a distant, bad memory. Chicago foreclosure activity came close to breaching the low set 17 months ago and defaults came within a hair’s breadth of puncturing the low of exactly one year ago. That latter point is exceptionally good news since that’s the front end of the pipeline. It’s all in the graph below. Given the month to month volatility it’s helpful to look back one year ago and realize that total foreclosure activity has fallen by 26% since then. Nevertheless, Chicago remains among the top ten metro areas in foreclosure rates. The country as a whole is also making steady progress as shown in the graph below, though you can clearly see that foreclosure activity remains above pre-bubble levels. RealtyTrac makes the comparison to the pre-recession period of Q1 2006 to Q3 2007 (a bit later in the game) and notes that foreclosure activity is now 21% below the average of that period. In just the last year it has dropped by 22% and it is at the lowest quarterly level since Q2 2006. 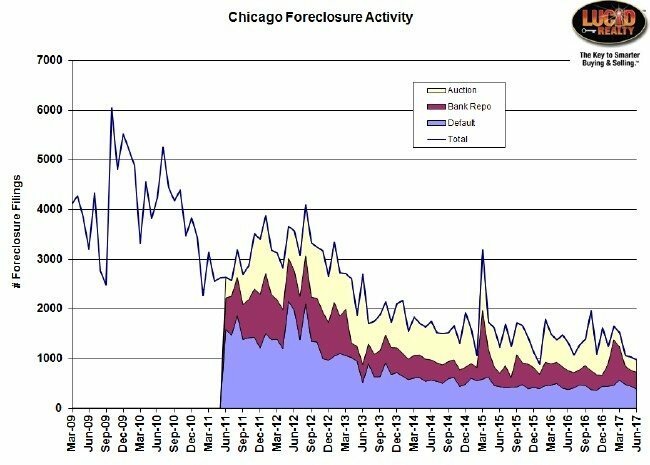 RealtyTrac confirms that Chicago foreclosure activity is also now below the pre-recession period, though it sounds like that is not the case for about half of the larger metro areas. Although foreclosures are fading overall, there has been a notable an [sic] uptick in foreclosures completed by some nonbank entities — counter to the sharp downward foreclosure trend among big banks and government-backed loans. These divergent foreclosure trends are likely the result of the big banks and government agencies selling off distressed loans over the past few years to nonbank entities that are now foreclosing on an increasing volume of that deferred distress. 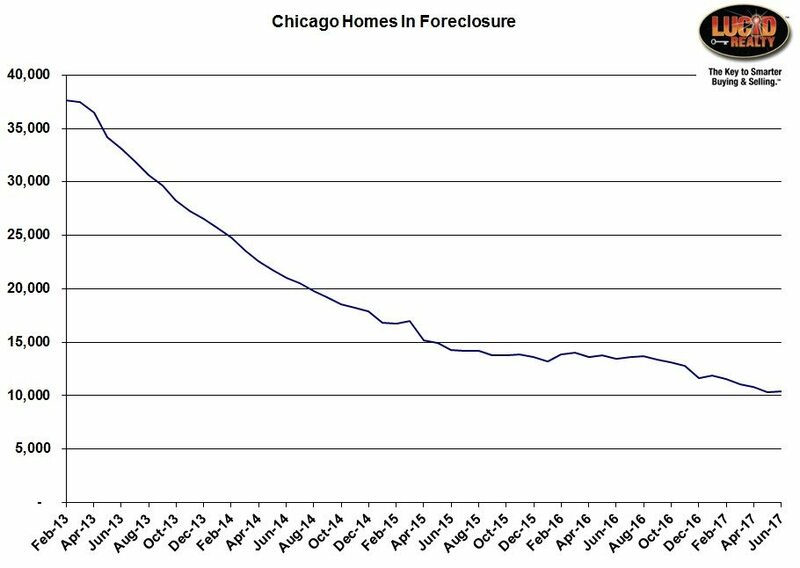 However, it’s a little disappointing that the number of Chicago homes in some stage of the foreclosure process remains stubbornly above 10,000 although it has been coming down lately as you can see in the graph below. It’s just that we actually went in the wrong direction in June, with an increase of 91 units. At least we’ve dealt with more than 72% of the problem that we had when I first started to track this data. But it looks like government continues to stand in the way of the country making further progress on this problem. The amount of time it takes to complete a foreclosure hit a new record high of 883 days, which is up from 631 days a year ago. WTF?! That’s going in the wrong direction. And Illinois is one of the worst states with an average time of 1,059 days (that’s almost 3 years!) compared to Virginia, which is the best state at only 176 days. So when you wonder why there are still so many boarded up buildings in certain parts of the city now you know why. Gary Lucido is the President of Lucid Realty, the Chicago area’s full service discount real estate brokerage. If you want to keep up to date on the Chicago real estate market, get an insider’s view of the seamy underbelly of the real estate industry, or you just think he’s the next Kurt Vonnegut you can Subscribe to Getting Real by Email using the form below. Please be sure to verify your email address when you receive the verification notice. While many people are ready to tuck the housing crash into the history books, its residue is still being felt by Gen X homeowners with minimal equity gains, according the latest Zillow Home Equity Report. Indeed, the Gen X demographic has almost as much equity as Millennials homeowners, even though the latter had far less time to gain equity. Zillow found that the typical Millennial homeowner—someone less than 35 years old—owed their lender about 76 percent of their home’s current value, while the median Gen X homeowner—someone between 35 to 50 years old—owed 70 percent of their home’s value. In comparison, Baby Boomers owed about 56 percent of their home’s value, while seniors with a mortgage owed 45 percent. Zillow also found the median homeowner with a mortgage has $78,683 in home equity, while homeowners who own their homes outright typically have $177,158 in home equity. The median homeowner has a loan-to-value ratio of 62.2, or owes 62.2 percent of their home’s current value, while 75.7 percent of homeowners have at least 20 percent equity in their homes. Five percent of mortgaged homeowners are close to owning their homes free and clear, but 10.4 percent of mortgaged homeowners have negative equity. According to an Orlando Sentinel report, Dr. Carson raised the issue yesterday during his keynote speech at the LeadingAge Florida annual convention. Citing a proverb that “you can gauge a society by the way they treat their elderly,” he noted that market forces are not working in favor of older Americans on fixed incomes. Dr. Carson pointed to HUD’s policies on reverse mortgages, including proposals that limit the initial amount of equity seniors can draw on while requiring a financial assessment to ensure seniors can to continue to pay property taxes and health care costs. He also stated his commitment to require lenders fully disclose all conditions of the reverse mortgage. Step One… Loan Originators and Realtors need to ask ALL clients if they’ve had a short sale, Deed in Lieu (DIL) or loan modification in their past. If they have, run the loan through Fannie Mae and Freddie Mac automated systems first to see if foreclosure credit, a “dispute” or incorrect “Date Reported” exists. Step Two… spread the word that HUD approved housing counselors can assist these clients to correct (not temporarily hide) erroneous credit to get affected consumers “mortgage-ready” ahead of signing a contract. Many of nearly 3 million consumers with a past short sale, over 5 million who have had a loan modification and an unknown number with a past DIL need urgent attention to correct a credit error known about since 2011. Affected past homeowners are now eligible to purchase a home again but are being denied new Fannie Mae and Freddie Mac conventional financing where their credit for a short sale, deed-in-lieu or modification shows up as a foreclosure and results in a new loan denial. The initial problem is when short sale, DIL and modification credit shows up as a foreclosure, often anticipated if past late mortgage payments went over 120 days. And, because the account was re-investigated after the short sale, DIL or modification closing date, the “Date Reported” becomes more current, causing the automated system to provide a denial because it appears that the required wait timeframe has not been met. Loan originators often proceed with processing a new mortgage after checking the required wait timeframe against the closing date of the past short sale, DIL or modification. But sometime during the process or even as late as underwriting, the loan is run through either Fannie Mae or Freddie Mac automated systems where the problem is first seen. Many lenders are unaware of the Fannie Mae workaround (there is no workaround for Freddie Mac!) and often tell blind-sided consumers to “go get your credit fixed and come back.” With the limited supply of housing inventory, sellers are reluctant to extend closing dates for additional time needed to investigate the credit error. Many homebuyers either lose the contract due to the delay to get this fixed or change their loan type to a higher interest rate portfolio loan or an FHA loan. It makes sense to engage the housing counseling industry into a pre-purchase solution. Loan originators are driven by contract deadlines. Non-profit housing counseling agencies work with clients on the “heavy lifting” to get issues corrected. And HUD approved housing counselors were able to verify “Economic Events” for extenuating circumstances for the past FHA “Back to Work” program. Leading this initiative is the National Foundation for Credit Counseling (NFCC.org), a non-profit organization with HUD approved housing counselors and credit counseling services. The organization is training and testing solutions to address known fixes, with an emphasis on assisting affected consumers before they even sign a contract. The goal is to alert the real estate and mortgage industries of this service to get potential affected clients “mortgage ready” before sending them back to the real estate and mortgage professionals. Providing this individualized service to those with a past short sale, DIL or modification who want to purchase a home again is a tremendous relief to these consumers who don’t want to relive their past nightmare again. This pre-purchase assistance needs to be promoted to affected consumers, the mortgage and real estate industries, loan processors and credit reporting agencies. Correcting issues can be as quickly as 1 day to 60 days. This will be an up-front fee paid service from an individual housing counselor. Loan originators who wish to assist these clients can refer them to HUD approved housing counselors who have been trained on how to get these unique credit issues corrected once and for all. Then, when the client is deemed “mortgage ready”, they can come back to the loan originator who can provide a credit back towards mortgage closing costs when these folks are ready for a new mortgage. And despite the overall economic recovery, it’s only a small improvement from 2014, going down by about 900,000 households. When people can’t safely afford to pay their mortgages and rent, it isn’t just a problem for those with a lower income or people who bit off more house than they can chew. Housing unaffordability also drags down GDP, slowing down overall economic growth for everyone, said Dan McCue, senior research associate at the Joint Center for Housing Studies at Harvard University, which publishes the annual State of the Nation’s Housing report. “It forces them to constrict spending on other items, which would reduce spending on other parts of the economy. They would buy less, save less, reduce savings,” said McCue. “It may make it more difficult to venture out and start a new company — or, living month to month, they’re much less likely to go back to school and get additional training; and may not be in the job that makes them the most productive member of the labor market,” McCue told NBC News. A big factor has been how wages haven’t kept pace with rising housing costs. “For lower income groups, it’s even worse than stagnation. It’s not keeping up with inflation,” said McCue. Housing costs are being driven by a limited supply of move-in quality, entry-level housing, said Diane Swonk, CEO of DS Economics. And what building is happening is happening upmarket. Also factoring in is a net decline in migration from Mexico after 2009 that decreased the number of skilled construction workers, and an increase in material costs. There were nearly 5.5 million seriously underwater properties in the US during the first quarter, according to new data from ATTOM Data Solutions. That’s an increase from Q4 of 2016 but still down by more than 1.2 million from the first quarter of last year. Seriously underwater properties – property where the loan amount was at least 25% higher than the estimated market value – accounted for 9.7% of all US properties with a mortgage in the first quarter, according to ATTOM. But those numbers don’t tell the whole story, according to Darren Blomquist, senior vice president at ATTOM. While negative equity is on a mostly downward trend nationwide, there are still swathes of the country where underwater property is almost the norm. And those underwater properties can pull down surrounding home values, Blomquist said. “Several of the cities with the biggest quarterly increases in underwater properties saw a corresponding increase in share of distressed sales in the first quarter, creating a drag on overall home values…” Blomquist said. Baltimore, Md. Saw the biggest quarterly increase in underwater homes, up 26,974. It was followed by Philadelphia (up 8,919), McAllen, Texas (up 7,746), Cleveland, Ohio (up 7,631), and St. Louis, Mo. (up 6,844). All of those markets still had fewer underwater properties in the first quarter than during the same period in 2016, ATTOM said. November 8, 2016 Distressed Homeowners, Lender Short Sale Practices, Loan Originators, Thank You! Why are so many people holding on to mortgages with high interest rates? Sentiment? Inertia? Apparently not. In the current issue of CoreLogic’s MarketPulse, Principal Economist Molly Boesel drills down into the universe of borrowers who are standing fast with their old loans, even though it looks on paper like a refinance would be a smart move. She finds that many of these borrowers haven’t refinanced either because they can’t or it really isn’t worth it. Looking at the mortgages that were outstanding at the end of May, Boesel found that 41 percent of them representing 31 percent of unpaid principal balance (UPB) had mortgage rates greater than 4.38 percent, roughly 100 basis points higher than the current rates at that juncture and a point at which refinancing makes financial sense. Eighteen percent of all mortgages (representing 17 percent of UPB) have rates between 4.38 and 5.0 percent, and 23 percent have rates over 5 percent. Why wouldn’t these borrowers refinance? First she found that a lot of them are currently seriously delinquent on their existing loans. While only about 2 percent of low interest rate mortgages (under 5 percent) are seriously delinquent, 12 percent of those with rates above 7 percent are 90 or more days past due and would be unlikely to qualify for a new mortgage. Even current mortgages with high rates present a difficult credit profile. Between 30 and 50 percent of loans with rates over 5 percent have at some point had a 30-day delinquency. The incidence rises with the rate. Only about 11 percent of those with rates below 5 percent have at some point been 30 days overdue. Those “ever late” borrowers may not be able to qualify for a low enough rate to make refinancing attractive. Boesel also removed mortgages in private-label securities from the list of refinancable borrowers because they would not be eligible for HARP loans that are reserved for refinancing Fannie Mae and Freddie Mac loans. After taking the currently delinquent, ever delinquent, and private label loans out of the mix she found that the share of loans with interest rates greater than 5 percent had fallen to 13 percent of those outstanding and to 7 percent of UPB. And that latter number is the final piece of the puzzle. Small outstanding balances may not be worth refinancing as the resulting savings would be low. The figure above shows the average UPB of outstanding mortgages that have never been delinquent and are not in private pools by their interest rate. Those borrowers with rates above 5% have very low UPB; those above 7 percent have average balances of $53,000. While mortgages rates are near historic loans, Boesel concludes, there may not be many borrowers left who have the incentive or are eligible to refinance. But since 2013, reports have proven that ”ruthless” or “strategic” default during the 2007-09 recession were relatively rare. In a 2015 follow up of this study, job loss and adverse financial shocks in addition to divorce, large medical expenses and other severe income loss attributed greatly to mortgage default. Most importantly in this report… While household-level employment and financial shocks are important drivers of mortgage default, analysis shows that financially distressed households do not default. More than 80% of unemployed households with less than 1 month of mortgage payments in savings are current on their mortgage payments. Even as the world contends with the most recent political-economic upheavals, from the aftermath of Brexit to mass migration, unfinished work remains from the 2008 global financial crisis. If left undone, the same stresses that led to the last U.S. housing crisis will continue to dog the financial system. Eight years have passed since Congress put Fannie Mae and Freddie Mac under conservatorship controlled by the Federal Housing Financial Agency (FHFA), meant to be a temporary salve to calm the market in the immediate aftermath of the financial crisis. In 2014, legislative efforts for long-term housing finance reform gained momentum under the bi-partisan Johnson-Crapo bill, but the bill never came to a floor vote. Now, new thinking on how to restructure the $4.5 trillion secondary mortgage market marks a growing consensus and renewed opportunity for a solution, according to a research symposium sponsored by the Penn Wharton Public Policy Initiative and the Penn Institute for Urban Research and held in June at the U.S. Capitol in Washington, D.C. The symposium examined two proposals — one from Andrew Davidson, founder and president of Andrew Davidson & Co. Inc., and one from housing finance and policy experts Jim Parrott, Lewis Ranieri, Gene Sperling, Mark Zandi and Barry Zigas. The share of homeowners who owe more than their house is worth remains above 10% nationwide, according to data from Zillow’s second quarter Negative Equity Report. Zillow said Thursday that 12.1% of homeowners with a mortgage are underwater, which is down from 12.7% in the previous quarter and from 14.4% a year ago. Federal regulators warned mortgage servicers Monday that they will still expect them to offer loan modifications to distressed homeowners even after the Home Affordable Modification Program expires at year-end. Democrats will adopt a party platform this week that omits most references to a need for continued post-housing crisis reforms, and instead focuses on expanding access to mortgage credit and support for industry regulation. Restructured and Refinanced: There is a way to use government entity funds as a new 2nd mortgage and combine these funds with six existing refinance programs to provide a refinance where none exists for millions of responsible, currently paying homeowners who have negative equity mortgages. The benefit? Credit stays intact, homeowners “stay put” in homes while equity escalates and communities recover. There are over four million homeowners across the U.S. who are still trapped in their current location because they have no refinance option for a first mortgage, a second mortgage, or a Home Equity Line of Credit (HELOC). Over 454,000 of them live in Florida alone! These are often people who are hanging on by a thread, but through no fault of their own, have no option for a refinance. Currently the only option available requires mortgage delinquency and proof of hardship to achieve a loan modification. We must provide solutions that do not destroy the credit of those with negative equity. Unless we provide a solution, there will be another wave of defaulted mortgages. These are not people looking for a handout. They desperately want to keep their credit intact, but no option currently exists to let them do so. The solutions presented in this report simply restructure current debt with available programs to allow the homeowners to stay in their home while staying current on their mortgage. Solutions to lift these homeowners out of negative equity are already available. We need to get our legislators and leaders on-board now because three of the options will expire in December, 2016. Read the entire report! Click the button below to download it and start reading now. Comments are welcome. The housing crisis seemed to start overnight in many parts of the country, going from good sales in December 2006 to no sales abruptly a few months later, when the bottom started to fall out. Many of those most affected by the crisis were elderly underwater homeowners who got into trouble after pursuing refinances that were often done for the purpose of helping their kids. Although the elderly are commonly more cautious when it comes to home financing, a large number mortgaged their homes with risky interest-only first and second loans — convinced by their lenders or their own children that these loans would be paid back with escalating equity fueled by rising home appreciation. A new study reveals that 81 per cent of Americans believe that the housing affordability crisis in on the rise. More than two-thirds of respondents in a national survey by the MacArthur Foundation say that it is more challenging to find affordable housing now than for previous generations. Just 29 per cent believe that the housing crisis is over and 76 per cent say that it is important that their elected leaders in Washington take action to address the situation. The majority (60 per cent) believe that owning a home is an excellent long-term investment. One area that has recently been named the metro with the highest level of underwater homes is also far above the national average for concern over affordability and putting household budgets under extreme pressure. June 10, 2016 – In 2004, millions of homeowners tapped into the equity of their homes through low-interest – or no interest – home equity lines of credit (HELOC). Their 10-year grace periods are now done and they’ve had to start paying. And that’s why HELOC delinquencies are now suddenly soaring. In March, second-lien HELOC delinquencies – the number of homeowners who are behind on this second mortgage – climbed 87 percent compared to a year ago, Black Knight Financial Services’ reports. Delinquencies may continue to climb, and those homeowners who cannot make the increased HELOC payments or refinance could find themselves facing foreclosure. HELOCs taken out in 2005, 2006 and 2007 comprise 52 percent of all active lines of credit. In 2005, there were about 850,000 home equity lines; in 2006 and 2007, it was 1.25 million. The grand financial total from just those three years: $192 billion. The recent increase in HELOC delinquencies is the first annual increase since June 2012, Black Knight notes. An 87 percent spike in delinquencies among 2005 HELOCs over the past 12 months has been attributed to most of the recent spike. Stuck in a home you can’t sell for enough to get out from underneath the mortgage? You are not alone. More homeowners in the Chicago area are trapped in underwater mortgages than in almost any other major metropolitan area in the country, according to two new studies released this week. One report, released Thursday by housing research data firm CoreLogic, found Chicago slightly better off than Las Vegas and Miami. But a separate study released Wednesday by real estate website Zillow places Chicago homeowners in the worst position in the nation, with a larger portion of homes underwater than in either Las Vegas or Miami. Policy still exists today that requires mortgage delinquency first before any help on lower payments for underwater homeowners is considered. There are still 6.7 million underwater homeowners “staying put” awaiting equity to return and who are paying their mortgage on time. A great majority of them have no refinance option except a modification…. which requires mortgage delinquency and a hardship first. Homeowners who have negative equity, who are staying put, and who are current on their mortgage… need to be given a refinance option just like those with equity available to them… a refinance that does not require mortgage delinquency first and allows continued, on time mortgage payments. Many have asked why I am obsessed with keeping problems that surround underwater homeowners at the forefront. It is because of continued policy applied to those who have negative equity that requires mortgage delinquency first just to be considered for a better finance option when no refinance is available, or when an underwater homeowner must short sale their home. For those with a non-Fannie Mae, non-Freddie Mac conventional first mortgage, a second mortgage or a home equity line of credit that has negative equity, mortgage delinquency is still required first just to be considered for a modification, their only option. This delinquent mortgage requirement results in a denial of a new secondary market mortgage and a prolonged period of time to get a new mortgage. This directly affects mortgage and real estate industries and the U.S. economy. A large number of loans originated as interest only first, second mortgages and HELOCs are now resetting to fully amortized payments. Interest only loans have a set period of time when interest is paid only. It is common to see a three, five, seven or ten year reset time frame where full principal and interest payments on the outstanding balance including principal that is unpaid start to be paid back. In areas across the nation where home values have not come back yet, homeowners are stuck with initial higher interest rates simply because they have negative equity. Fully amortized payment increases have been seen as high as 400%. The only option available for negative equity non-Fannie Mae, non-Freddie Mac conventional first mortgages, second mortgage or home equity line of credit (HELOC) is a modification that.… you guessed it… requires mortgage delinquency and a hardship first in order to get help. An alarming number of elderly homeowners who have refused to go delinquent on their mortgage but have negative equity interest only loans are now coming forward. It is especially heartbreaking to see homeowners in their 70s and 80s demoralized by the fact that they have to destroy their credit just to be qualified for a lower interest rate. And, if these underwater homeowners ultimately short sale, the negative credit from the required mortgage delinquency results in a higher rent payment. A great deal of early press educated our nation about “strategic defaulters”, claiming that many who walked away voluntarily were able to make payments but chose not to. However, a 2015 study entitled “Can’t Pay or Won’t Pay? Unemployment, Negative Equity, and Strategic Default” cites that though unemployment was the single biggest financial shock, most financially distressed households didn’t default and underwater homeowners tapped into retirement resources and friends or relatives to stay afloat. Even among unemployed households lacking enough savings to make even one monthly mortgage payment, more than 80% stayed current. Another issue centered around families who could afford to keep paying their mortgage but chose not to do so. Despite media attention to strategic defaulters, the study shows that these were rare. Fewer than 1% of households with the financial means to pay instead chose to walk away. The study largely confirmed that personal economic events led to mortgage defaults without citing negative housing equity as the overriding factor. It also showed that many underwater homeowners struggle to hang on to their homes perhaps longer than they should, wiping out retirement assets awaiting positive equity to return. Many who are in the mortgage business in areas still affected by negative equity are acutely aware of how the required mortgage delinquency results in a downward spiral of credit that prompts other negative consequences for underwater home owners just trying to stay put. This country can’t afford to turn a blind eye to what we all saw coming in 2007-08. Good credit is still the benchmark of the mortgage and real estate industries and the driver of a good economy. Solutions are available right now. There were more than a million homeowners whose properties exited negative equity status over the past year, with the potential for another million to do so if home prices continue to rise, according to CoreLogic. CoreLogic reported Thursday that the number of underwater properties at the end of the first quarter totaled 4 million, which equates to 8% of all homes with a mortgage. That figure was down 6.2% from the fourth quarter and 21.5% from a year ago. While negative equity rates continue to drop nationally from their 2012 peak, the share of homeowners underwater in the Rust Belt remains elevated, according to data from Zillow. The negative equity rate, which measures the share of all homeowners with a mortgage who owe more than their home is worth, was 12.7% during the first quarter, down from 13.1% in the fourth quarter and 15.4% in the first quarter of 2015. The negative equity rate hit its peak in the first quarter of 2012 at 31.4% and has either fallen or held steady every quarter since then, Zillow said Wednesday. The U.S. foreclosure rate and mortgage delinquencies have fallen to levels not seen since before the housing crash eight years ago, but that doesn’t necessarily mean that the housing market has return to normal. CoreLogic’s Chief Economist Frank Nothaft spoke with Scotsman Guide News about the improved housing market and why the foreclosure rate could take another two years to return to its traditional norm. Completed foreclosures ticked up for the month in March, but overall the trend has been down, right? When you look on a year-over-year basis, and we compare our latest data from March 2015 to March 2016, the news is very good, and it has been very good for a number of years. The total amount of foreclosure inventory — that is the percentage of mortgaged property that is some stage of the foreclosure process — that’s dropped 23 percent from a year ago. We are now at the lowest inventory level, the lowest foreclosure rate, since November 2007 prior to the onset of the Great Recession. It is still elevated if we compare it to what the foreclosure rate was 15, 20 years ago, so we are not back to a normal foreclosure rate yet, but we have made substantial progress in the U.S.
Do you believe we’ll get back to a foreclosure rate that would be considered normal and, if so, when? Yesterday I received a letter from HUD Secretary Julian Castro that I have been selected to serve on the U.S. Department of Housing and Urban Development’s Housing Counseling Federal Advisory Committee. Millions of homeowners across the U.S. have been devastated with lives changed forever due to the housing recession. I want you to know that it is your stories of challenges… how you plodded through even though you lost a great deal and did everything possible to stay afloat… before you finally had to ask for help… that changed my perspective on how I will do business in the mortgage industry forever. May 22, 2016 Alert, Distressed Homeowners, Homeowner Resources, Thank You! Eligible borrowers should expect a letter from their mortgage servicer about a principal reduction no later than Oct. 15, 2016, the FHFA said. A day that many in the housing industry thought would never come is finally and actually here, as the Federal Housing Finance Agency is making official what was first reported several weeks ago – widespread principal reduction is coming. In what it is calling a “final crisis-era modification program,” the FHFA announced Thursday that it will be launching a principal reduction program for some borrowers whose loans are owned or guaranteed by Fannie Mae or Freddie Mac. But the program is not quite as widespread as was first reported. Initial reports in the Wall Street Journal suggested that the FHFA’s principal reduction program may make fewer than 50,000 “underwater” borrowers eligible for principal reduction, but what wasn’t known until Thursday was the exact number of borrowers the FHFA’s program could affect. While the percentage of properties with negative equity decreased during 2015, the lowest-priced homes continued to struggle to regain value, according to Black Knight Financial Services. This could enable Hardest Hit Funds to be used as a new second mortgage to refinance underwater higher 2nd mortgages and reset interest only home equity lines of credit unable to be refinanced. One of these mortgages, the FHA Short Refinance, can even provide a refinance where none is available for conventional 1st mortgages that are not Fannie Mae or Freddie Mac, therefore not eligible for the Home Affordable Refinance Program (HARP). The Home Affordable Refinance Program (HARP) will expire on Dec. 31, 2016. A reduction in the interest rate of the junior lien, to replace an ARM, a balloon or call option with a fixed-rate, fully amortizing junior lien. The new loan’s maximum LTV ratio is 97.75% of the current property value. The FHA Short Refinance program expires on Dec. 31, 2016. VA is not concerned about the 2nd mortgage being refinanced, other than it must be assumable. VA Loan Center: FL/homeloan@va.gov. 4/4/16: per Nancy, 727-319-7500. The housing crash might seem like old news, but for families left behind by the recovery it remains a defining economic reality, with negative equity preventing moves and limiting choices in life. Cook County’s top 10 towns for foreclosures are all in the south suburbs, according to data compiled by the Institute for Housing Studies at DePaul University. Residents on a typical block in middle-class towns like Matteson, Country Club Hills and Richton Park can expect one of their neighbors to be in foreclosure, because about one in 30 homes was in foreclosure as recently as 2014. In a handful of the poorest towns — Harvey, Ford Heights, Phoenix, Riverdale, Robbins and Sauk Village — more homeowners are foreclosed upon than obtain new mortgages, a surefire recipe for vacant homes, declining tax bases and blight. “Everybody seems to think we’ve recovered from the housing crisis, but for many communities of color that’s not the case,” Petruszak said. The number of lender-mediated sales in the Chicago area — short sales and foreclosures — accounted for 26 percent of existing home sales in February, compared with more than 50 percent just two years ago, according to Midwest Real Estate Data, the local multiple listing provider. But the long-term snowball effect of so many vacant, foreclosed properties in mainly black neighborhoods was exacerbated because banks took less care of the properties they owned there than they did in largely white communities, said Petruszak, who has helped bring national discrimination cases against six lenders. The couple have friends who walked away from mortgages that no longer made sense, but Mitchell Versher said that wasn’t his style, and that if his wife hadn’t suffered a couple of layoffs, or if they were able to renegotiate their debt again, he’d have liked to stay put. Still, he and his wife expect ultimately to be forced from their home. And any hope Mitchell Versher had of retiring is gone. He’s looking online, for a rental, he said. It is time to get changes made for underwater homeowners; Still 6.4 million underwater nationally, and most are desperately trying to stay put! The housing recession since 2007 has resulted in real estate and mortgage problems never experienced before in U.S. history. One of those newer problems was a massive number of short sales, where homes are sold for less than the mortgage balance on the loan. In order to short sale, a common practice of nearly every lender in the U.S. was to require that the distressed homeowner go delinquent on their mortgage before the short sale approval could be given. The short sale process was lengthy and the required delinquency almost always exceeded 4 months. After 120 days of mortgage delinquency, a foreclosure code was placed on the credit of unsuspecting short sellers. The foreclosure code was not apparent to those of us in the mortgage industry until years later when the past short seller, eligible for a new conventional mortgage, received a “Refer with Caution” denial for a new loan. Lender underwriters unaware of the erroneous credit code would tell past short sellers to go back to their short sale lender and get the problem fixed. The short sale lenders would claim they had coded the short sale correctly, and point to credit reporting agencies to make the fix. The credit reporting agencies, now seeing this problem throughout the U.S., started drilling down to where the problem was in the code. This is when it was discovered that there was multiple credit code being used for a short sale, but borrowed from the Metro 2 foreclosure code. Additionally, foreclosure payment history codes of “8”(repossession) and “9”(collection) were adding to the mix. And when fixes were applied, “dates reported” were pulling forward, suggesting the credit problem was more recent than the short sale closing. Why was this a problem for the mortgage and housing industry? A foreclosure code meant a 7 year wait to get a new mortgage, rather than the 2 year wait after a short sale in effect at the time. At that point, there were over 9 million past short sellers. That equated to over 16% of total U.S. mortgages! The slowdown of the housing comeback was critical, and stalling the reentry of 9 million past homeowners back into the housing market would affect the housing market. It was imperative for this problem to be solved. The road to a solution started with a loan officer in Florida and a credit reporting agency, Acranet Credit, in California. The loan officer saw the seller credit was being coded as a foreclosure over and over again in the Fannie Mae and Freddie Mac automated systems and went to Acranet credit reporting agency. The Acranet credit manager was a board member of the National Consumer Reporting Association (NCRAinc.org) and brought the problem to the NCRA. The Florida loan officer attended the 2012 NCRA Conference with proof and met a representative with the Consumer Financial Protection Bureau (CFPB) at the conference. In April of 2013, the Florida Loan officer and the executive director of the NCRA went to Washington, D.C. and, thanks to U.S Congressman Gus Bilirakis’s office, met with staff of the Senate Banking and Finance Committee. On this first meeting, multiple problems were presented and it was quickly determined that pinpointing the critical credit code problem was paramount. Offices of representatives for “Hardest Hit” states, where it was thought that the credit code problem would be most apparent, were visited. The offices of the U.S. Treasury, the Consumer Financial Protection Bureau and U.S. Senator Bill Nelson’s (D-FL) office were also visited. U.S. Senator Nelson’s office took a special interest in this problem along with the CFPB. Senator Nelson is from Florida, a state that was 3rd from the top where housing had been hit hardest. In 2012, Florida’s average of homes sold as short sales was tipping 30%, and 48% of homes owned in the state had negative equity. This problem threatened a real housing recovery for Florida. On May 7, 2013, U.S. Senator Bill Nelson required that the CFPB and the FTC get a solution to the credit code problem within 90 days. There was much talk about a “specific, universal short sale credit code” just like there was for a foreclosure or repossession, or judgment. In June 2013, the Florida loan Officer, the NCRA executive director and 30 NCRA board members met in Washington, D.C. again and met with CFPB Director Richard Cordray and 4 CFPB directors. Later that afternoon, the Florida loan officer and the Acranet credit agency manager met again with the CFPB and were stunned to learn that, though affected consumers were consistently stating they were told by their short sale lender that a delinquency of their mortgage was a requirement to get the short sale approved, in fact the lenders were telling another story…. that underwater homeowners were ceasing to make payments, waiting to be served foreclosure by their short sale lender. To hear this was shocking. All of the press seemed to be about strategic defaulters, who are able to make mortgage payments but chose not to. Yet, we were finding little evidence of underwater homeowners who wanted to stop paying their mortgage. Instead, homeowners who called for help were bewildered that they had to destroy their credit to exit an underwater home. They wanted to make their payments but were told no help was available until they went delinquent! While in Washington, D.C., it was also learned that the credit code change all of us were fighting for would not happen. Instead, lenders would be allowed to make a change in the Fannie Mae system when the erroneous foreclosure code showed up on past short seller credit. This would take effect on Nov. 16, 2013. The Nov. 16, 2013 change did not work…. but 2 fixes found by accident were working! The CFPB Complaint Letter worked the most and seemed to trigger an immediate “change” in the credit that resulted in an “Approve” upon a new credit pull and resubmission to Fannie Mae. The same change occurred if a Lender Letter could be obtained from the lender stating the loan closed as a short sale and not as a foreclosure. The critical key here was that lenders were able to make a change of the code internally. And, on August 16, 2014, Fannie Mae again made a change to their automated systems Desktop Underwriter/Originator that finally allowed lenders to go into the system and make a change when a foreclosure showed up on credit code for a past short seller. Because so many lenders, loan originators, credit reporting agencies and governmental agencies are now aware of the credit code problem of past short sellers, it was decided to switch gears. Instead of using efforts to find more solutions (though this is an ongoing process! ), emphasis is now on the network of help available to past short sellers. The Help Network is a growing resource center that includes lenders, loan officers, realtors, credit reporting agencies, HUD Approved Counseling Agencies and governmental agencies and representative offices that are aware of this problem and can help. And if you are not sure who can help in your state, email Pam Marron at pmarron@tampabay.rr.com and ask for help with resources. “Back from the Housing Brink” defines 3 different client types that have developed from the housing crisis and where opportunity exists for loan originators and realtors to assist these clients. GulfCoast Chapter of the Florida Association of Mortgage Professionals wishes to thank the Pinellas REALTOR Organization for joining with us to support this program! Defined, statistics, where these homeowners are at and where they are moving to in the U.S. and specifically Florida. Retrieve “feasibility report” commonly done by FHA Inspectors and useful to attract buyers and for mortgage financing. Report cost: $200-$250. Need for refinance option of non-Fannie Mae, non-Freddie Mac 1st mortgage and 2nd mortgages and HELOCS for 7.1 million homeowners still underwater! Only option currently is modification that requires delinquency. *HousingCrisisStories.com is set up to provide buyer and loan originator assistance to prepare cases for underwriting FHA “Back To Work” and where “Extenuating Circumstances” may exist for a conventional mortgage. Lenders who provide FHA Back to Work, allow Extenuating Circumstances and provide pure HARP 2 will be promoted. RealtyTrac® (www.realtytrac.com), the nation’s leading source for comprehensive housing data, today released its Q2 2015 U.S. Home Equity & Underwater Report, which shows that as of the end of the second quarter there were 7,443,580 U.S. residential properties that were seriously underwater — where the combined loan amount secured by the property is at least 25 percent higher than the property’s estimated market value — representing 13.3 percent of all properties with a mortgage. The second quarter underwater numbers were up from 7,341,922 seriously underwater homes representing 13.2 percent of all homes with a mortgage in the previous quarter — making Q2 the second consecutive quarter with a slight increase in both the number and share of seriously underwater properties — but were down from 9,074,449 seriously underwater properties representing 17.2 percent of all homes with a mortgage in the second quarter of 2014. The number and share of seriously underwater homes peaked in the second quarter of 2012 at 12,824,729 seriously homes representing 28.6 percent of all homes with a mortgage. The share of distressed properties — those in some stage of the foreclosure process — that were seriously underwater at the end of the second quarter was 34.4 percent, down from 35.1 percent in the first quarter of 2015 and down from 43.6 percent in the second quarter of 2014 to the lowest level since tracking began in the first quarter of 2012. Conversely, the share of foreclosures with positive equity increased to 42.4 percent in the second quarter, up slightly from 42.1 percent in the first quarter and up from 34.1 percent in the second quarter of 2014. The universe of equity-rich mortgaged properties — those with at least 50 percent equity — decreased on a quarter-over-quarter basis for the second straight quarter, down to 10.9 million representing 19.6 percent of all properties with a mortgage at the end of the second quarter. That was down from 11.1 million representing 19.8 percent at the end of the first quarter and down from 11.3 million representing 20.3 percent at the end of the fourth quarter, but still up from 9.9 million representing 18.9 percent at the end of the second quarter of 2014. Major metro areas with the highest percentage of equity rich properties reflect areas of continued growth in home prices: San Jose, California (43.8 percent), San Francisco, California (38.3 percent), Honolulu, Hawaii (36.7 percent), Los Angeles, California (32 percent), New York (30.7 percent), Pittsburgh, Pennsylvania (29.4 percent), Poughkeepsie, New York (28.0 percent), Oxnard, California (27.5 percent) and San Diego, California (26.9 percent). Markets with a population greater than 500,000 with the highest percentage of seriously underwater properties in Q2 2015 were Lakeland, Florida, (28.5 percent), Cleveland, Ohio (28.2 percent), Las Vegas, Nevada (27.9 percent), Akron, Ohio (27.3 percent), Orlando, Florida (26.1 percent), Tampa, Florida (24.8 percent), Chicago, Illinois (24.8 percent), Palm Bay, Florida (24.4 percent) and Toledo, Ohio (24.3 percent). Markets where the share of distressed properties — those in some stage of foreclosure — that were seriously underwater exceeded 50 percent in the second quarter of 2015 included Las Vegas, Nevada (57.7 percent), Lakeland, Florida (54.8 percent), Cleveland, Ohio (52.9 percent), Chicago, Illinois (52.5 percent), Tampa, Florida (51.7 percent ), Palm Bay, Florida (51.5 percent), and Orlando, Florida (51.2 percent). Those states with the highest percent of distressed properties with positive equity included Colorado (72.0 percent), Alaska (69.8 percent), Texas (66.4 percent), Oklahoma (65.2 percent), and Nebraska (64.4 percent). Major markets where the share of distressed properties with positive equity exceeded 60 percent included Denver, Colorado (83.7 percent), Austin, Texas (83.1percent), Honolulu, Hawaii (77.5 percent), San Jose, California (77 percent), Pittsburgh, Pennsylvania (75.9 percent), Jackson Mississippi (75 percent), Nashville, Tennessee (69.3 percent) and Houston, Texas (69 percent). “The strong South Florida price increases over the past few years have moved many homeowners from negative to positive equity. We would encourage the remaining distressed homeowners to ask for a Broker Price Opinion (BPO) regarding the value of their property — many may be surprised at their improving value,” said Mike Pappas, CEO and president of Keyes Company, covering the South Florida market. Residential properties owned between seven years and 11 years accounted for 38 percent of all seriously underwater homes as of the end of the second quarter. The highest seriously underwater rate is for homes owned for nine years, 21.6 percent of which are seriously underwater, followed by those owned for 10 years, 19.8 percent of which are seriously underwater, and those owned for eight years, 19.0 percent of which are seriously underwater. The RealtyTrac U.S. Home Equity & Underwater report provides counts of residential properties based on several categories of equity — or loan to value (LTV) — at the state, metro and county level, along with the percentage of total residential properties with a mortgage that each equity category represents. The equity/LTV calculation is derived from a combination of record-level open loan data and record-level estimated property value data, and is also matched against record-level foreclosure data to determine foreclosure status for each equity/LTV category. Foreclosures w/equity: Properties in some stage of the foreclosure process (default or scheduled for auction, not including bank-owned) where the loan to value ratio was 100 percent or lower. Investors, businesses and government institutions can contact RealtyTrac to license bulk foreclosure and neighborhood data or purchase customized reports. For more information contact our Data Licensing Department at 800.462.5193 or datasales@realtytrac.com. RealtyTrac is a leading provider of comprehensive U.S. housing and property data, including nationwide parcel-level records for more than 130 million U.S. properties. Detailed data attributes include property characteristics, tax assessor data, sales and mortgage deed records, distressed data, including default, foreclosure and auctions status, and Automated Valuation Models (AVMs). Sourced from RealtyTrac subsidiary Homefacts.com, the company’s proprietary national neighborhood-level database includes more than 50 key local and neighborhood level dynamics for residential properties, providing unrivaled pre-diligence capabilities and a parcel risk database for portfolio analysis. RealtyTrac’s data is widely viewed as the industry standard and, as such, is relied upon by real estate professionals and service providers, marketers and financial institutions, as well as the Federal Reserve, U.S. Treasury Department, HUD, state housing and banking departments, investment funds and tens of millions of consumers. A RealtyTrac analysis of open Home Equity Lines of Credit originated during the housing bubble years of 2005 to 2008 shows that there are nearly 3.3 million HELOCs scheduled to reset at fully amortizing monthly mortgage payments between 2015 and 2018 after a 10-year period with interest-only payments. The average increase in monthly payments when these HELOCs reset will range from $138 for those resetting in 2016 to $161 for those resetting in 2018. More than 1.8 million of the resetting HELOCs (56 percent) are on homes that are seriously underwater, with a combined loan to value ratio of 125 percent or more, and the percentage of underwater homes with resetting HELOCs is much higher in some markets such as Las Vegas (89 percent), Inland California (80 percent or more in many markets), Orlando (79 percent), Reno, Nevada (78 percent), and Phoenix (76 percent). The heat map below shows markets with the most resetting HELOC shock over the next few years, both by sheer number of HELOCs scheduled to reset (size of the bubble) and by the percentage of resetting HELOCs that are on homes seriously underwater (color of bubble). This heat map displays metropolitan statistical areas with a population of 200,000 or more. SUPERB data collection for Distressed Homeowners and Boomerang Buyers. Why did we create HousingCrisisStories.com? We created this site to help the sheer number of those affected by Short Sale and Foreclosure issues. 8 to 9.1 million still underwater in July 2014 per RealtyTrac. This appears to have come down to 5 million per Corelogic, Dec. 2014. That’s still a lot of underwater homeowners we want to help. Inventory Myth Busting: Why is Home Inventory So Low? Our current administration inherited a financial crisis that this country has not experienced anything close to since the Great Depression.